Kermit the Frog says: Yeah, well, I’ve got a dream too. It’s about singing and dancing and making people happy. 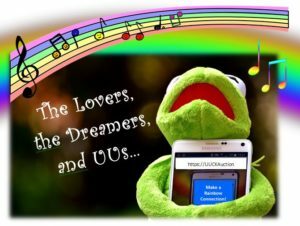 That’s the kind of dream that gets better the more people you share it with.” In honor of our Treats and Talents auction with its theme of “The Lovers, the Dreamers, and UUs ” this year, this service will be a romp through Muppet theology about rainbows, lovers, dreamers, life, and Unitarian Universalism.